Cancel any paid game at any time, up to 3hrs prior to game time, and get a full refund. Transfer to any Standard Game when calling out 3hrs or more prior to game time. Game Changes – ability to cancel a NCH game up to 48 hours before the game for a full refund, or transfer into any other NCH game up to 2 hours before the game. Membership Term: Your membership month begins as soon as your membership is activated by the StinkySocks Hockey office (within 24 hours or your order) and will renew on the same day monthly unless canceled in advance for the renewal date. Terms of benefits: You must own and wear a StinkySocks Hockey jersey in any game that is booked under this membership and your membership must be active on the day of the game to receive your benefits. If you fail to wear your StinkySocks Hockey jersey, your benefits will not apply and the full cost of the game will be charged automatically. A no show for a game booked under this membership is subject to the full cost of the game being charged. Any failed renewal payment will result in suspension of benefits. You must be otherwise eligible to participate in a StinkySocks Hockey game to receive benefits under this program. Game Level Selection: All policies apply, including our level policy. Unlimited members may only participate in games that are appropriate for their level. Game Cancelations Exclusion: A game booked in advance under the 50% benefit cannot be rebooked under the complimentary game benefit after cancelation. Recurring Charges: By purchasing the StinkySocks Hockey Unlimited Membership you give us permission to charge your credit card for the membership on a monthly basis, on that day of your renewal (e.g. if you signed up originally on the 12th of the month then you’ll be charged on the 12th of each month following. These charges are in addition to any charges that are related to league(s) for which you are registered. Discount Limitation: Please note that membership level discounts cannot be combined with any other offer or discount. The best offer will apply. Other terms: The number of memberships is limited and all games are subject to availability. All other StinkySocks Hockey rules and policies apply. In the case that you fail to appear or fail to wear your StinkySocks Hockey jersey, you authorize StinkySocks Hockey to automatically charge the difference between the amount paid and the full cost of the game. All membership charges are non-refundable and benefits are non-transferable. This program may be canceled at any time. 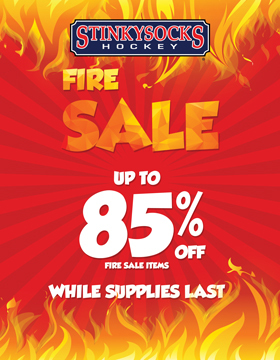 Pricing is subject to change with 60 days advance notice by StinkySocks Hockey.